I told you before how happy I was to see Tyson after his tracheostomy. He instantly looked healthier and calmer. I love this picture of him because after watching him struggle for every breath for way too long, he finally looked peaceful. 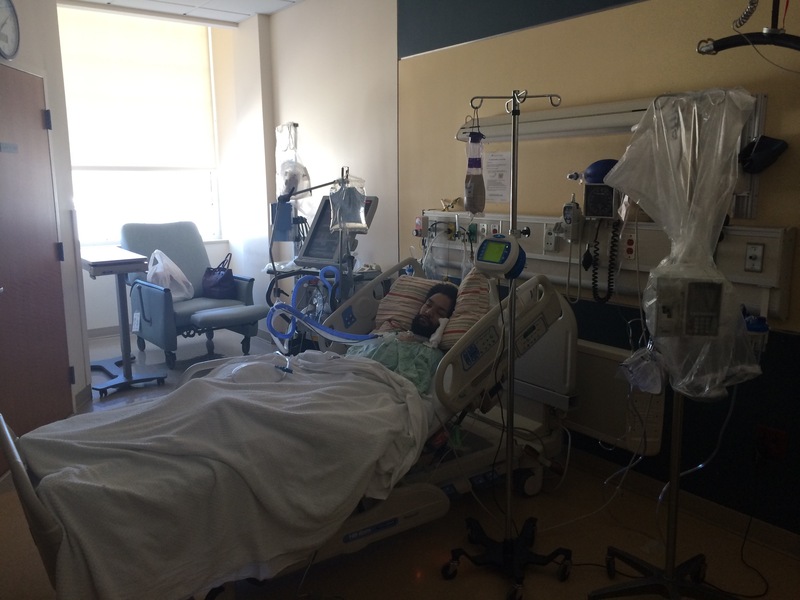 Tyson was transferred out of ICU and into a private room in the Telemetry unit after one week. Truthfully, the only thing they were focusing on was his heart rate which was elevated to around 120. Still, Tyson remained hooked to monitors. Audrey and I continued to do shifts so that Tyson was never alone. Understandably, the more he “came to”, the more scared and nervous he became, so having one of us by his side at all times put him at ease. This also meant that I could be home with the boys after school for dinner and bedtime. I quickly came to the realization that everything was going to be a challenge with respect to “learning” Tyson all over again. Maybe I was in the clouds a bit and overwhelmed with the fact that I had almost lost my husband, but for some reason, I had it in my head that Tyson would bounce back right away from everything. I mean, the days leading up to his cardiac arrest, Tyson was sitting up in his chair and talking to me. How was it possible that he now was unable to open his mouth or hold his head up? All I wanted was to hold him. I was happy when he slept and so anxious when I couldn’t understand him. I could always make him comfortable before and now, I was afraid to touch him because he was so fragile. I had to guess what was bothering him, in terms of positioning or his pain levels, etc. The nurses in ICU gave us a picture chart to help us communicate. I sort of laughed at it when they first gave it to me, thinking “we don’t need this silly thing” and moments later found myself trying to use it with him. We fumbled through and he could barely give me an indication of a simple “yes” or “no”. Extremely frustrating for both of us. I think Tyson was very much in shock and confused as to why he couldn’t move his mouth. At most, his upper lip would move. He was trapped in his body. Still, all I could do was thank God that he was still alive and find a way to move forward. The following morning, I packed up the kids’ things, fed them breakfast and cuddled with them one last time. I headed over to the hospital and met Audrey. We went through the normal discharge process, I signed a bunch of papers confirming that I understood his needs, how to care for his PICC line and other similar details. The plan was for me to follow the ambulance up to Wallingford, CT. 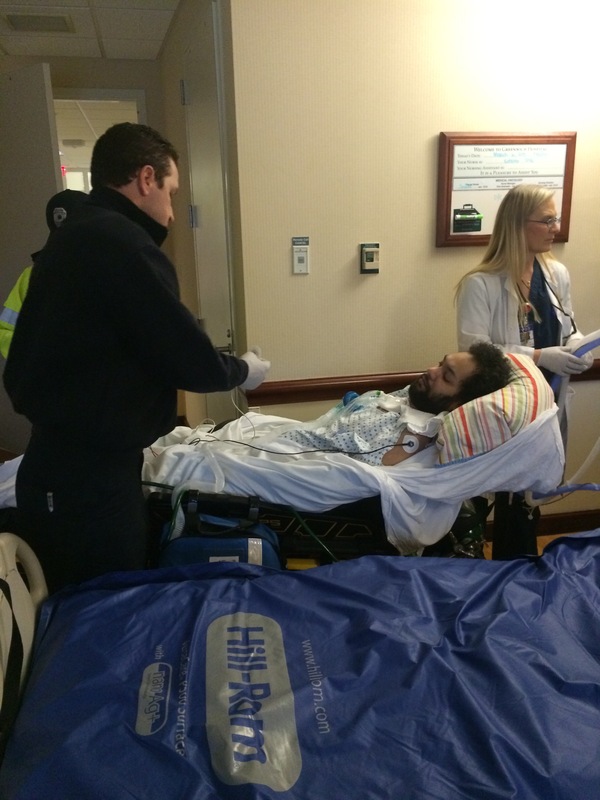 When they came to the room to transfer Tyson onto the stretcher, we were ready to go. 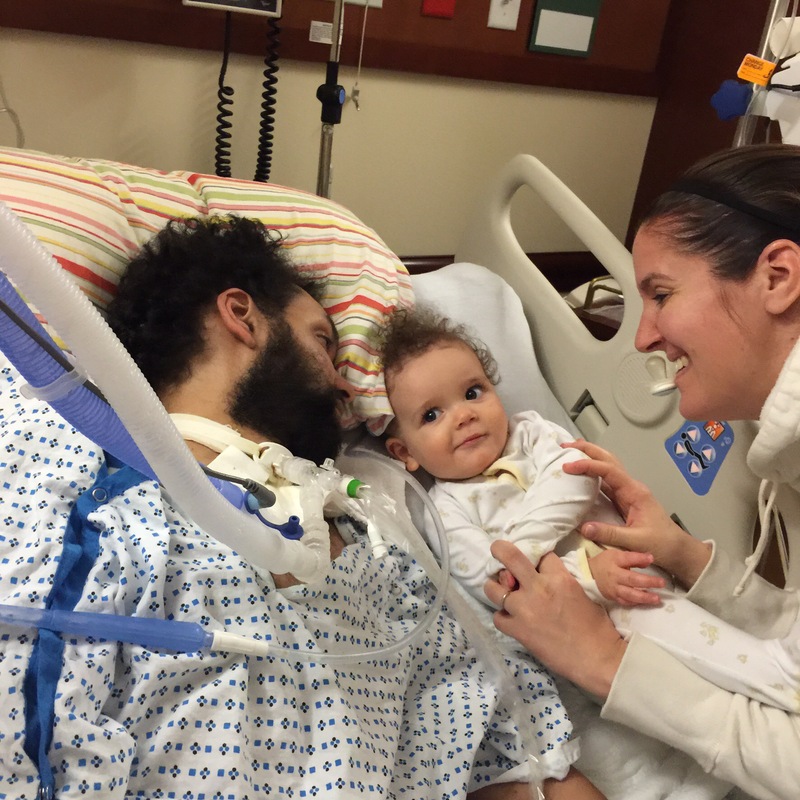 Once they carefully loaded Tyson onto the stretcher, they switched his ventilator from the hospital one to a transport one. 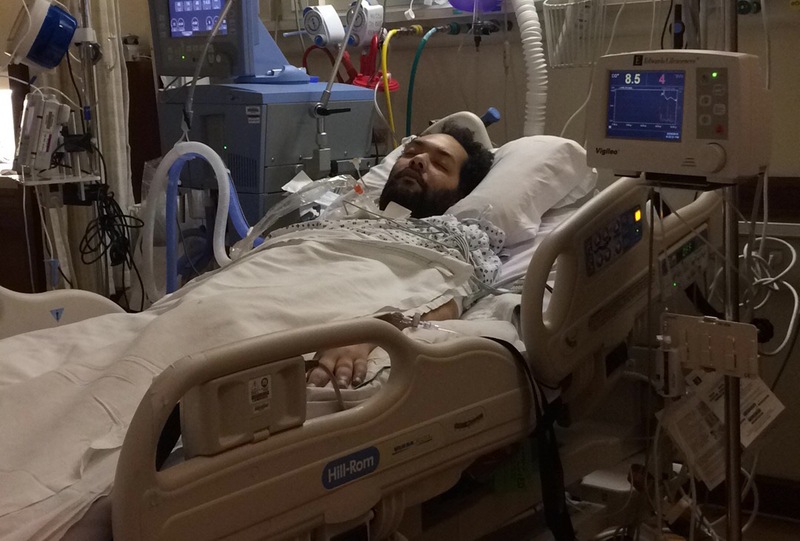 I spoke with the respiratory therapist and the two men who would be traveling with him and asked them to give Tyson a few minutes to adjust to the new vent before heading out. Tyson gave us the “green light” and they wheeled him out to the ambulance. At this point, Audrey headed back to the house where she met my dad and the kids and began their trip back home upstate. I followed the ambulance to the Merritt Parkway as we headed north an hour to Wallingford. We arrived at Gaylord around one and got settled into our room. Tyson slept most of the day but we still met with a few doctors and members of the Respiratory team. Each time I was asked to explain Tyson’s situation and medical history, I felt like I was trying to sell it to them. Trying to explain how Lyme was largely responsible for his current condition was challenging. And then when I added “and he receives ongoing stem cell therapy in India”…well, I may as well have said we were from Mars. I didn’t care. We were there to get help with the ventilator. As much as I’d like to say their opinion on his diagnosis didn’t matter, it did matter when I tried to get them to administer Ceftriaxone (his IV Lyme antibiotic). The doctors at Gaylord weren’t familiar with Lyme or any appropriate treatment measures and wanted more information. I gave them Dr. Horowitz’s info and Dr. Murphy’s and said they’d be happy to help. Instead, they called the infectious disease doctor at Greenwich Hospital who had made it clear that he didn’t believe Lyme existed in the chronic form and would rather give Tyson a straight diagnosis of ALS and said the antibiotics were unecessary. Before I invested an ounce of my energy to fighting this decision, I asked Tyson, “Do you want the Lyme meds?” He looked at me and mouthed “yes.” That’s all I needed to hear. So, I had a conversation with the doctors with supporting evidence that the bacteria can linger in the body and that Tyson felt better with it, etc., and before long, it was approved. Right away, they resumed the weaning process. To start things off, they wanted to get sort of a baseline and put him on a setting that offered very little support and forced Tyson to see what he could do. Honestly, it seemed like the equivalent of pushing him off a cliff. He couldn’t breathe, wasn’t ready for it and wanted to stop. I struggled for a moment about whether or not I should just trust the process or speak up. I jumped in and said, “I think this is too much- can you switch him back?” They did. Personally, I thought Tyson could’ve lasted longer with that short trial but it just goes to show that this all needed to be at his pace and comfort level. I’m sharing this story is because it’s important to understand how Tyson felt through all of this and from where his fear arose . He had no control over his breathing and needed to rely on others for the controlling and safekeeping of his vent. That was crippling to him. In order to get better, he needed to trust himself and his team of therapists to take care of him. Over the next few days, we met two RT’s in particular, Ryan and Melissa, who were SO amazing. They were calm, supportive, and clearly put Tyson at ease. He began weaning every day, starting out small and gradually increasing his wean times. 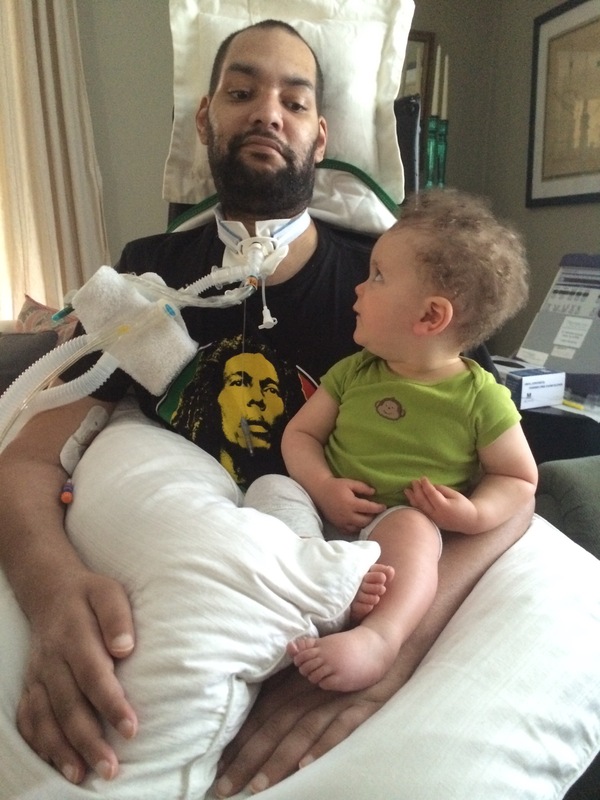 Their support and encouragement helped fuel Tyson to keep moving forward. One of the wonderful benefits of weaning is that it’s exercising his diaphragm and that encouraged him every time. He began taking a few sips of water each day, too. Tyson had a physical therapy session each morning for 30 minutes and in the afternoon for about the same amount of time. They got him up and in a chair on our second day there! Tyson was very upset that it had a head rest but he knew he needed it and I reminded him that it was temporary. Below is a picture of Tyson during a PT session. 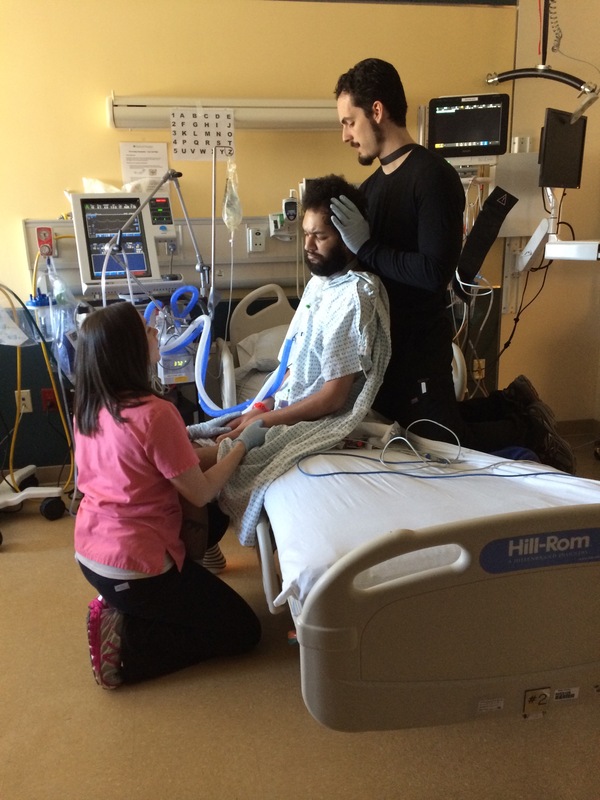 Tyson’s body was so incredibly stiff from the cardiac arrest, so the therapists just focused on basic range of motion exercises and even just sitting upright like this was a huge step. The “in-between” times looked like the picture below. Sometimes we would watch tv but he mostly slept. We had a word chart that we got pretty good at using to communicate. It was five lines with a section of the alphabet on each line. I’d go through the lines and when I got to the one that had the letter in it that he wanted, he would raise his eyebrows. Helps if you remember each letter as you go, haha! Tyson would finish spelling a word and I’d say, “wait, what was the first letter?” He did his best to roll his eyes 😉 If Tyson wanted to get my attention, he would make a little “raspberry” sound with his lips. It was very faint but I could work with it. The Respiratory team wanted Tyson to try a speaking valve so that we could hear his voice. It’s something that they’d attach to his trach tubes and by manipulating the settings and deflating the cuff (a balloon that’s inside his esophagus) we could hear his voice. However, this process was so difficult for Tyson. After the first attempt, he was extremely fatigued. He looked like he had just played an entire game of basketball. He did not like it one bit. Again, I struggled with finding the right balance of gently pushing him when I knew it was safe and letting him sort of skate. I know it must seem cruel that this was even a question for me but I felt responsible for pushing him in the right way so he didn’t give up. I needed to be there to tell him how strong he was but also listen and comfort him, too. I remember specifically one day, Ryan was giving Tyson a pep talk telling him how good it was for him to try the speaking valve and that he knew Tyson was capable of making it work and Tyson just broke down in tears. I asked him what he was afraid of. I said, “honey- you’re safe, the vent will pick you up if you miss a breath and Ryan will change you back to your settings if you’re having trouble.” He was trying to tell me something but I couldn’t understand him so I grabbed the chart. He spelled out, “I died.” Well…that was a poignant moment. Tyson was so overcome with the fear of what had happened on February 19th that it was preventing him moving forward. What I quickly learned was that Tyson knew best. Even at this most fragile state, he knew his body and knew his limits. He is so strongly attuned to his breathing that he can detect an issue before the incredibly sensitive vent alarms catch on. And he’s always right. Always 😉 This is such an amazing ability and has proven to be very helpful. Once I understood that, I could continue to be his coach and cheerleader on the side, following his lead. We didn’t get too far with the speaking valve over the course of our stay, but that didn’t bother us. His recovery would continue at his pace. The speech therapist was eager to have Tyson try a machine that would allow him to speak by moving his eyes (I forgot the name of it). I told her we were not interested in that but rather in exercises geared to bring back what we had recently lost a couple of weeks ago like jaw opening exercises and swallow techniques. Again, this is where the diagnosis of just “ALS” hurt us. They didn’t believe he would improve and were focused on making him comfortable and adjust to this new condition. If we believed he was solely dealing with ALS, we would’ve likely welcomed the speaking machine. But we had seen him decline and rise from it over and over again in the past. We didn’t believe that this was right for him at the moment. Regardless, Tyson gave it a shot, probably because he could tell she was really anxious for him to try it. The machine kept freezing and eventually she had to just shut it down. I can’t tell you how much I miss the sound of his voice, but honestly, Tyson and I communicated just fine with the word chart. The other thing we did with the speech therapist was a swallow test. First, they tried to send a small scope up his nose to try to look at his swallowing capabilities. Unfortunately, it wasn’t until the scope was already in his nose that they discovered he had some cartilage or something that was blocking its path. The next option was to have Tyson swallow some milky formula while viewing through some sort of X-ray machine. There’s a name for all of this, forgive my crude description. They hoyered him out of bed and into a wheelchair and brought him downstairs for the test. I came along to be his voice and to keep him calm. They placed a lead vest on him as I watched from the other room with the nurse and therapists. You could see his esophageal muscle on the screen as it opened and closed like a gate as he swallowed the formula. By the fourth sip, the muscle had weakened and as a result, some had slipped into his lungs. This is called aspiration and is dangerous because it can cause pneumonia, among other things. What this meant for Tyson was that he was not allowed to drink anything other than water. We were both pretty bummed as we headed back to the room. We got over it in about 24 hours. Tyson was eventually weaning for 16 hours a day. Show off 😉 We were thrilled with his progress and truthfully wanted to lengthen our stay, but the doctors decided that four weeks was enough. They gave us our discharge date of April 6th. There was much preparation to do in order for him to be able to come home. I needed to have all of the right equipment available and delivered to the house, I needed to arrange for nursing care to help me with Tyson and I needed to be trained to handle the ventilator and his trach. This meant undergoing 10 hours of vent training, including how to do an emergency tracheotomy, how to troubleshoot in an emergency situation, and how to do circuit changes, as well as daily trach dressing changes. We had met an outstanding respiratory therapist at Greenwich Hospital named “Muggsy”. In fact, from the moment Tyson was scheduled for his tracheostomy, doctors and nurses were asking me, “Have you met Muggsy yet? She’s the best! You have to meet her!” Anyway, I met Muggsy in the ICU and she convinced us to try for Gaylord and told me the best vent company was PromptCare and that she’s worked with a man named “Guy” there for years. So when it came time to get our own vent, the case manager at Gaylord set us up with Guy at PromptCare and we are so fortunate for that connection! I traveled back to Greenwich to meet him at our house. He needed to learn more about Tyson and make sure our home was safe for a vent and that we had enough outlets, etc. Guy was very upbeat, positive, and matter-of-fact, which I love. The house passed his inspection and we agreed we would meet the next day at Gaylord to begin my training. If you knew how much I avoided science classes in school, you’d laugh at the thought of me learning how to use a vent and care for a trach. But becoming well- versed in the care and maintenance of his vent and trach meant that he would be allowed home. As I was learning the process, I’d begin to apply what I had learned to Tyson and watch eyes sort of bug out as I got near his trach. He’s so patient. I picked it up pretty quickly and now it’s truly like second nature to me. I traveled home a second time to receive the new hoyer lift, the hospital bed and the new wheelchair. Ugh. Vanessa, Katherine and Gia met me at home and helped me move furniture, clean, and reorganize in anticipation of Tyson’s home-coming. We are blessed with the greatest friends. I kept reminding myself that this was all temporary. It certainly doesn’t make it any easier, but it’s all I could do. All told, the four weeks spent at Gaylord were very productive and valuable. Tyson came home stronger than when he went in, he proved he could wean, he was able to sit in his wheelchair for longer periods of time, and his neck got slightly stronger. I was also more comfortable caring for him. The four weeks spent at Gaylord also allowed us time together to process everything that had happened and make a plan to move forward. Every day was challenging and we broke down a lot, but we are much stronger now. It was extremely difficult being away from the boys. Abren had started crawling and Calvin grew an inch, I think. We tried FaceTime with Calvin but it only made matters worse. He cried because he missed us so much and wanted us all to be home together. It was actually better when we didn’t speak and I checked up on him through my parents. He had a lot of fun when he wasn’t focused on the fact that we were apart. Tyson came home on April 9th. Guy got to the house first to get all of the equipment set up. Once the ambulance pulled up, we got Tyson into his “new” wheelchair and brought him into the house. He was so happy to be home (and to watch SportsCenter on the big living room t.v.). He was exhausted and only stayed up in his chair for about an hour. 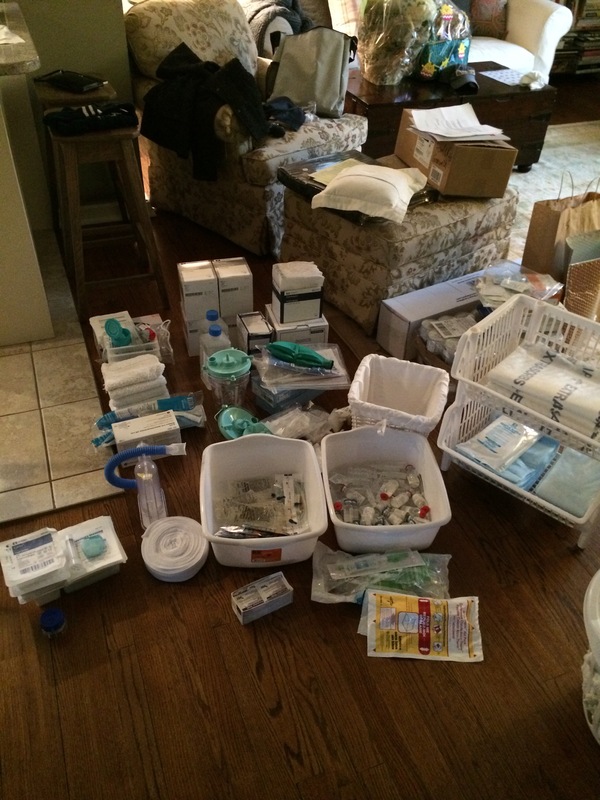 This picture represents about a third of his medical supplies. I got it all sorted out and stocked the hall closet, the guest room, and Tyson’s bedside table. The boys came home the following day. Poor Calvin cried tears of joy as we hugged each other in the kitchen. Abren just stared at me and Tyson 🙂 It took my breath away to see Calvin reunited with Tyson. We resumed in-home physical therapy Monday morning. It was great to see Mike and he was happy to see Tyson home safe and sound. He brought Tyson a new Bob Marley t-shirt to replace the one that was cut up in the E.R. The sessions ran for an hour each, Monday through Friday. Tyson was still incredibly weak at this point but Mike was able to feel flickers of muscle contractions throughout Tyson’s body. To strengthen his core, he did edge of the bed sitting with Mike or myself holding him up as he would bend down at the waist and come up. 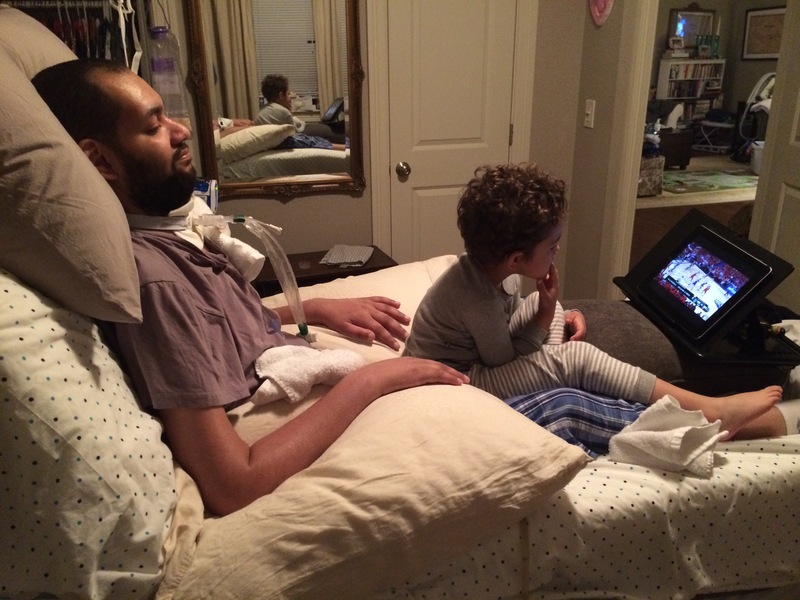 We watched over the next several weeks as Tyson’s strength improved. It is truly astounding how well he responds to the right physical therapy. We had a couple of therapists come visit him to see if they could offer help and treat him and they all declined. Said there was nothing they could do. And here’s Mike working so hard with Tyson and getting incredible results. It’s awesome. 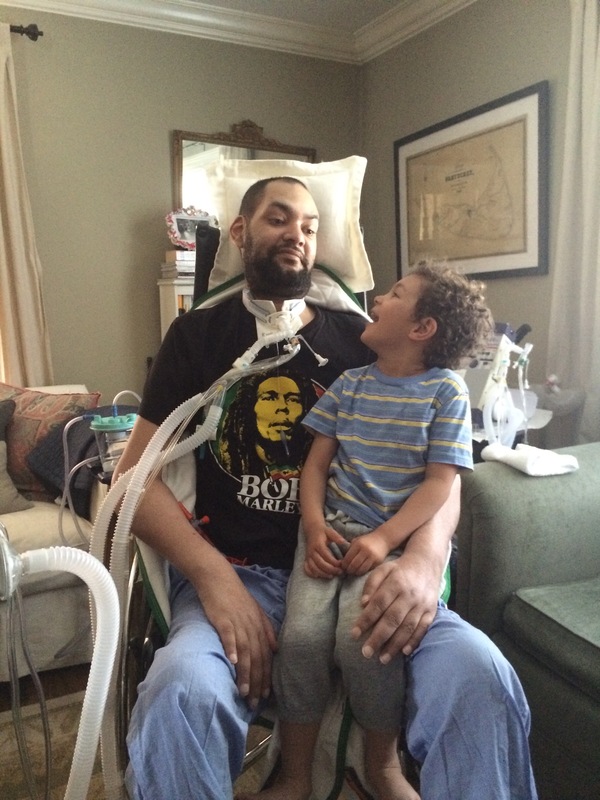 After PT, Mike helps us get Tyson hoyered up and into his chair for a few hours. The sitting position for Tyson is so valuable because it opens up his lungs and diaphragm, helps strengthen his neck and core, and allows him to be social with the family. Over the summer, Tyson started to wiggle his hips, something he has been incapable of doing for a long time. We continue to see Mike on a regular basis and just last week, he found NEW muscle contractions in his hamstrings! We treat each session like he’s training. We play music and Tyson is very focused with every move. There’s a photograph hanging in the living room of Tyson dunking a basketball in a high school game. Mike taps the photo on the way out like he’s leaving a locker room and heading out to the field. Makes us laugh and makes Tyson smile every time. We have also had a few phone consultations with Dr. Horowitz, who is guiding us with the treatment of the Lyme disease. A few months before Tyson’s cardiac arrest, I had emailed him and pleaded with him to “take on” Tyson’s case. He has a waiting list that’s a couple of years long so we have been seeing his awesome associate, John. Because Tyson’s case is so rare, Dr. Horowitz would pop in to see us each visit. I read his book, “Why Can’t I Get Better?” and have been using it like a text book. In there, he outlines some suggestions for treatment of chronic neurological Lyme. I was hoping he could help. I shared with him the protocol (which was similar to one of his suggestions) that was used on a patient from Germany who had Lyme with ALS and who had also received human embryonic stem cell therapy with Dr. Shroff. We have become good friends with this woman and she has been a great source of motivation and encouragement for us. She was given 3 months to live and has defied all of that. She’s now very healthy and strong. Anyway, his office called me while Tyson was in the ICU and said he’d be happy to help as soon as we were ready. In July, we discussed his case at length. He treated Tyson with some antibiotics for a 3 month period over the summer which really seemed to clean him up a bit. It was during that time that Tyson wiggled his hips. Every time I bring Abe into the room, he yells out “daddy!” Sometimes I place him on the bed in front of Tyson and they stare at each other and make faces. Tyson taught him how to purse his lips and make a kiss. I place Tyson’s hands on Abren so he can feel like he’s holding him and so little Abey can feel his daddy’s touch. Moments like these are so beautiful. We are so grateful Tyson’s here with us. We were also extemely blessed and fortunate to have had six months of nursing care covered for us when we came home, the costs of which were paid for by a private donor. These nurses all had extensive backgrounds in critical care which included knowledge of vent/trach, iv meds, iv hydration, nourishment assessment, among other things. Because of their care and support (and the support of myself and the two boys), Tyson has been steadily improving and thriving in this environment. 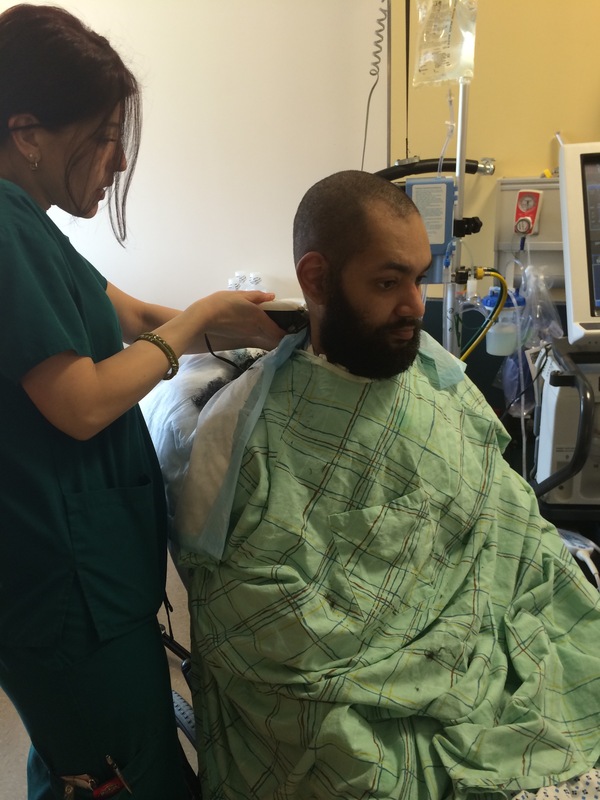 They have helped keep Tyson safe and stable, which is an enormous feat for someone in Tyson’s critical condition. Most importantly, having their support and expertise has allowed for him to be home with his family rather than in a hospital or nursing home where he would be at risk for infection, not have access to the world class physical therapy he receives and be separated from myself and our two boys. We’ve formed wonderful bonds with our core team of nurses and are forever grateful for their outstanding care and compassion. Presently, Tyson’s case can be best described as complex but stable. He’s undoubtedly survived something that, by all rights, he shouldn’t have. There is absolutely no question in our minds that the stem cells had a significant role in his survival and continuing recovery. 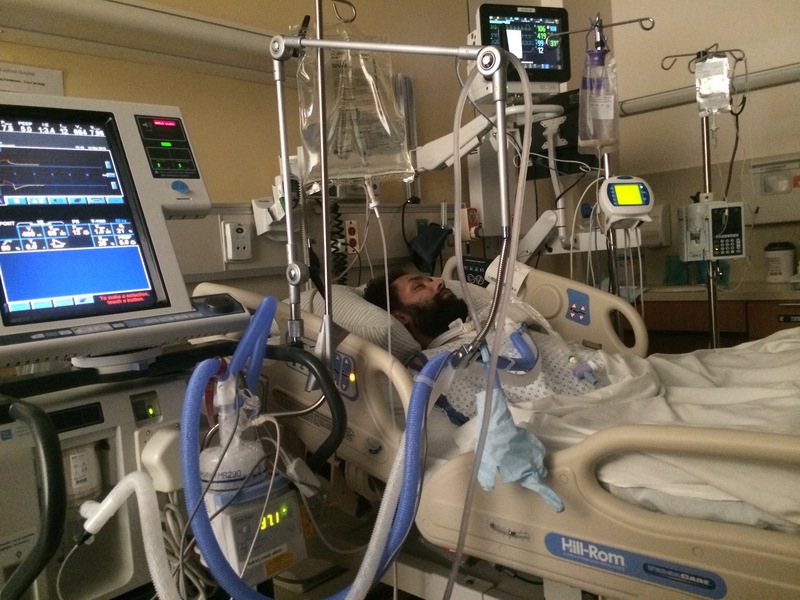 Tyson remains fully dependent on the ventilator and requires care around the clock. His eyes move slowly and it takes a while for him to focus. His mouth is moving better. He’s making progress with the PT, we have slowed down with the vent weaning but will pick it up again soon, and above all, he is happy to be home. He is emotionally stronger than he was two months ago and remains a fighter. At one of his lowest moments, he said to me, “I understand why people give up.” I said to him, “I know this is difficult but you’re not quitting.” He smiled and said, “no, I’m not.” Our home isn’t the same without Tyson’s voice and laughter. I still find myself talking to him from another room, asking him questions and waiting for a response. I miss him and I know he feels the same. We do everything we can to create happy moments and keep him upbeat. Despite our efforts, however, it’s not easy. We are both beat and longing every day to have our old life back. Based on what I’ve seen in tyson, I have complete faith in a full recovery. It will take a lot of time and a lot of hard work but we know it’ll happen. We have excellent support from our team of doctors who remain committed to seeing Tyson through this and to ensure he gets everything he needs along the way. It has honestly seemed as if the “reset” button was hit on Tyson and he’s been given a chance to start from scratch. Believe it or not, there is still more for me to update you on and I will do a better job of that going forward. I want you all to know that I share every single message, email, text, and phone call from you with Tyson. You wouldn’t believe how he lights up! He talks about his old high school buddies, his big family, his Polo family and everyone in between. You all mean so much. Your support over these past couple of years has been phenomenal. We are so lucky. With that said, I would like to ask for your help, if you are able this holiday season. 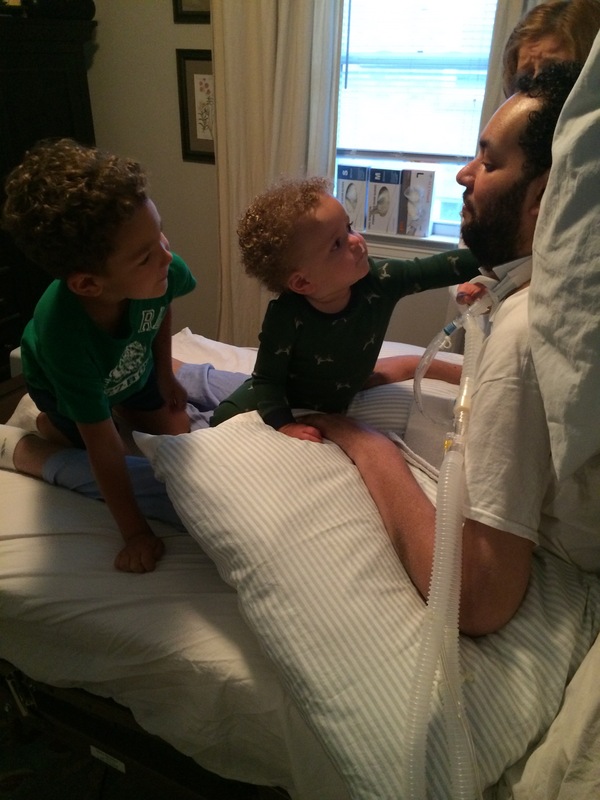 Tyson’s medical costs remain a constant burden for our family. Any donation would greatly impact our family and Tyson’s road to recovery. If you would like to donate, please see the attached link for the gofundme account that has been set up on our behalf.